Most organisations would say they aspire to performance improvement. But good intentions quickly get lost in the immediate as time passes quickly and priorities are overlooked. Time pressure can also be the reason performance improvement initiatives focus on ‘a part’ at the expense of ‘the whole’. The Ouroboros effect, where the solution is worse than the original problem, haunts narrowly defined performance improvement efforts that overlook systemic issues. For example, in 2007 Fosters Brewing cut the alcohol content of Victoria Bitter (VB) beer from 4.9% to 4.8% to save millions in tax. For further savings, they cut the alcohol content again in 2009 to 4.6%. Customer complaints plus significant loss of revenue and market share ultimately reversed what seemed a good decision at the time. VB returned to its original alcohol content and packaging in 2012. A large organisation with a significant record of achievement thought a short term Lean Six Sigma project would fix a labyrinth of long standing and well developed internal change resistance mechanisms. The performance aspiration is clear. The strategy is questionable. For every failed change management effort, each subsequent effort is harder. Frightening when competitive pressures threaten financial sustainability and the power of social media can undermine a long standing record of achievement. Conceptual skills are often falsely assumed. Visualisation is a proven way to test assumptions. Process and value stream maps create a visual representation of what stakeholders previously assumed was shared understanding of a process to reconcile differences and define As Is or the current situation. When a visual representation, or process map, is used to identify differences in views, it is also highlights reasons for variance. Reconciling variance will inevitably improve quality and the debate is worth having in defining To Be which optimises As Is. All change should have a clear performance improvement target. That target, when defined in isolation of the upstream and downstream implications, may have unintended consequences. Fosters learnt that the hard way but they are not alone in experiencing the Ouroboros effect! 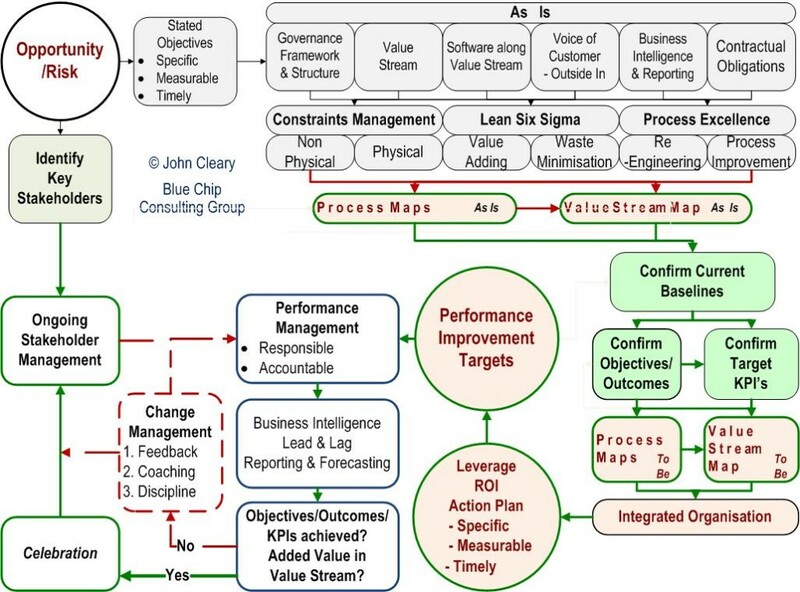 The process map above outlines a performance improvement methodology. Have the debate that’s worth having. Test your assumptions and define your own performance improvement model. 2. Objectives – what are the Specific, Measurable and Timely objectives of the PIP? 3. Stakeholders – identify and manage key stakeholders – are they supporters or thwarters? Structure – who reports to who? Silos or effective cross-functional activity? Value Stream – map from the trigger to completion of the PIP as a visual tool for participants. Functional Software – where is information kept/secured/stored/retrieved/integrated? Voice of Customer (VoC) – customer’s feedback on their experiences and expectations of what constitutes performance improvement. In unregulated markets, customers define performance. determine performance improvement targets and to provide trend reports against those baselines. Engage key stakeholders in discussing optimisation options. Following discussion and agreement, map processes along the Value Stream as they are To Be. Have stakeholders confirm the accuracy. Engage stakeholders in understanding the optimisation and confirming that To Be optimises As Is. Use the engagement to build commitment to integration transcending the functional structure. Stop to reflect on your learning and your understanding of organisational capability to deliver To Be. If you think this is too complex, remember that for every failed change management effort, each subsequent effort is harder. If you are committed to sustainable change, simple solutions won’t cut it. In complex organisations, simple solutions are rarely more than band aids and band aids don’t fix bullet holes. The next article will commence at Confirmation, Design and Implementation Planning. In the interim, have the debate that’s worth having. Define your performance improvement methodology on a page. BCCG complements performance improvement projects. Give us a call on +61 411 522 521 if you need assistance or wish to discuss your performance improvement project.